He's feeding the crows??? No telling what other diabolical things HOB is up to. I say, grab the duct tape, set up a chair outside, tape that man to the chair and put some of that kitty chow in his lap. That'll cure him!!! LOL! Truly, this could be the start of a very good movie. Don't be surprised if you see it intertwined in some Hollywood plot very soon. Fabulous story telling as always...that's hilarious that he was feeding them!! I did that one in my backyard - My Mom was so mad. At first I had a vivid picture of Alfred Hitchcock's The Birds in my mind. I could just see you all boarding up your windows being held captive in your home. Then I got to the punch lineHOB feeding them Mable and Zelda's food???!!! Do they know? I was rolling on the floor!!! OMC Madi guards the pantry where her food is kept. I'm sure she counts each piece at night. Heads would roll if she found out her food was been thrown to the birds. HOB is a very brave man. Keep in mind, what goes in one end comes out the other. In a month or two, depending on if it rains, he might have to 'clean' the effects off the roof, making the feeding of the crows not so fun any more. HAHAHAHAHA....that is hilarious. At first it made me think of the Stephen King book, The Dark Half (but those were sparrows if I remember correctly)....we nickname neighbors we don't know either. There was "mustang guy's house" until they moved...."Hillbilly" and then "brother & sister" because it's a couple and they look like they're brother and sister. I think this is awesome, Betty. I happen to really love birds, and I am very fond of crows. HOB is pretty cool in my book! Lol, I was going to suggest you research the native Americans' view of crows for some insight. But, uh, never mind. Maybe you just need to lock up the cat food. Or HOB. This was the best story yet. We had turkey vultures on the roof across the street. Found out a wood chuck was dead in the back yard. Yes you have to feed them to have them. Yuk in our case. Feeding crows? Now that's devotion. Awwwww!! I for one applaud HOB!! Yay for him!! LOL!!!! And I think you can't do any better than "The House Where the Crow Gathers"!! It's says CLASSY!! The pastor that performed my parents' wedding wrote a children's story about the crow he kept for a pet. I can't remember the name of his book, but he reports that crows are really loyal and intelligent. This crow would follow him as he drove in his car from his home to the church. He fed it and loved it as a pet. So HOB has a lot of pets, but he's not alone in crow appreciation! Uh oh...I can't say that I've ever heard of support groups for people like HOB, but I'm sure there has GOT to be some kind of Crow Lovers Anonymous out there! I wish you could see me laughing out loud at the computer screen! People are staring at me at work!! I love your confrontation with HOB. Hey, a man's got to feed his crows. You didn't know that? LOL, "The Crow Whisperer." Reminded me of "The Birds." Good read here my dear. This is 100% something my husband would do. He lectured me this morning on how mice are cute and we should feel guilty for stealing their homes. Those birds are HUGE!!! Get a few of them up on the roof, and before you know it...CRASH.....they fall through and you've got a horrific scene from The Birds in your living room! haha...love this...nig smiles at teh closing scene...i am sure they heard nothing...lol. "lined up like Starbucks customers in their business power-suits"
Heh, heh. So Hubby feeds the crows, eh? That would do it. On the other hand, that's better than finding dead rodents in your gutters or something. We once had a mouse that my wife was irritated that I refused to kill. I think a mouse gives a house a bit of character. ONE mouse, mind, not an infestation. I admit, I probably would have fed him (I called him Jerry) but there was no need. He was mostly concerned with eating the soap. He preferred Ivory, and nibbled a bit from the bar every night. Love this story! I like crows. They don't creep my out at all, never have. I think they're beautiful. Your husband must be stopped! Crows are frightening birds and they could peck your eyes out in two seconds flat! That is indeed a little creepy. My husband would be the opposite: out there with a BB gun! I still say he's innocent! Well, HOB certainly gives us all food for thought and laughter! Not a big fan of crows...they can be quite macabre! I wondered where you were going with this and then I got to the part where you discover HOB with a fist full of cat food. Then I started laughing and kept on laughing. Quite brilliant. "lined up like Starbucks customers in their business power suits.....placing their order to the busy crowista below." Brilliant line. So when you find him laying in the yard with his eyes pecked out, you know you need to add cat food to the shopping list. Perhaps when you pass out rocks to tricksters they will purge the problem. It is said crows bring you wisdom. Thanks for today's laugh..much needed! Yikes! We have crows but no one is feeding them.. They're creepy and they poop everywhere. Hope your husbands cuts you a break and stops! The Crow Whisperer... I love it. I immediately thought about Edgar Allen Crow when I started reading this. I may have mentioned this when you first wrote about EAC, but one of my favorite bands, Guggenheim Grotto sings a song called The Wonderful Wizard and there's a lyric that talks about Edgar Allen Crow. It always amuses me. I'm with you... 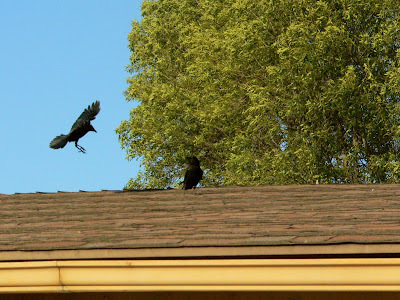 I think a flock of crows taking up residence on my roof would pretty much freak me out. I wouldn't worry. The crows are doing your Halloween decorating for you. What do you feed crows? I thought they were carnivore scavengers. If you get a chance tomorrow, please stop by my blog. I'm hosting a Halloween Haunting! I would never have guess where this one ended -- never heard of anyone feeding crows before. I have heard of making ONE crow your pet (they are apparently smart) but to take on a whole flock?? I am wondering what our house is known as (I'm pretty sure the neighbors aren't aware it's true name is Dreamfarm. We are probably Haunted House with Ragweed. so the real culprit that led to the emergence of the crows on the roof was your HOB... HAHAHA..
but I think your HOB was so cool! I love bird... including crow. "Everything is connected to everything else" says the first law of ecology. Need I say more? At least you found out why they are there! Ha! Made me laugh for sure! So he has been feeding them all along and not saying a word to you about it. Especially when you gave him every opportunity to do so!!! If we are not feeding this cute homeless kitten wandering around our neighborhood, we certainly aren't feeding any crows! Oh my gosh, that is just too funny! Crows?!? I snorted coffee out my nose reading your blog this morning I was laughing so hard! I love how you ended this story...it sounds like the start of a book. All those birds would really creep me out!!! LOL Betty, and just think, your neighbors could have been saying: "It's the Murder of Crows house" yep, they could. My name is Evan and I work at a digital advertising agency called Night Agency (nightagency.com). We recently launched a new community called HAIKYU (haikyu.com) where people can submit their own work as well as voting for their favorite Haiku. It’s a great way to discover new work, get recognized, and even win prizes. After seeing your Blog, we thought you and your followers might be interested to join our new and upcoming Haiku community. To celebrate the launch of this new community we are running a contest until October 31st where the Haiku with the most votes will win $250! It would be great if you could share the site with your followers/readers/fans and send us any and all feedback you may have (info@haikyu.com). Thank you for your time, and please let us know if you have any questions. Unbelievable..Crows eat catfood? That's the makings of some award-winning Haiku, Betty! I LOVE IT! At least HOB wasn't wearing a crow costume while throwing the cat food up on the roof. And why cat food? Your poor cat was probably wondering why he had to go up on the roof to get his dang food! This is an old camping trick - throw bread up on your neighbor's roof so that in the morning all the birds will be pecking at their roof, eating up the bread. It's SO annoying! "BB gun" and "BBQ" that's all I'm going to say..
We also name the houses around us. It's too good to put in a comment, so I thank you for the inspiration for a blog post of my own. I will reference you, thanks! And here I thought I had commented on this one. Your HOB is a silly man. Crows are of the devil!! HOB is a man after my own heart- and so onery!! We have tons of crows around here, but they don't land on the house. However, I'd rather crows than buzzards.... Back in Pa. there are lots o fthem around. And when they've been cold, they'll perch ontop pf something tall (ie a house) and spread their wings to warm up. They look like death birds. 1) There is one house in our neighborhood that I named a week or two ago... The Pigeon House (ugh! I'm not sure if I feel more strongly about the fact that they're pooping mostly on one roof this year or the fact that I see that roof every time I drive away from my house or go get the mail. 2)HOB reminds me a little of my father-in-law. Only for him it's squirrels. He has not only sat outside feeding them nuts for so many years that the mamas bring their babies to meet him, he has been known to rehab them. Herbert was the last one. Took him to the local Caribou Coffee all the time... until he got loose and ran around for a few minutes, ha! 3) I've got to be more timely in reading your posts. Scrolling down to the bottom of all the comments is liable to make me forget what I wanted to say. I feel as if I have just read Poe's The Raven again :) I'm sorry, I have to laugh. It wouldn't surprise me if Hollywood came calling. Seriously though, there are crows who hang out at ocean beach out here and I really do not like them. I've done things like actually cross to the other side of the highway if they are lurking around my path. Maybe I should start feeding them ? You are such a great writer, Betty! Hope the school kids appreciate having you for a teacher!! Hmmm. When we moved to Illinois, I dubbed crows the state bird. Another thing in common, Betty! Just stopping back by to congratulate you on your potw. Well done. Oh I find them creepy too. I was attacked by one recently when hit me on the head from a long distance. I'm still not over the shock and it was months ago. Congrats on your POTW mention. Well done. Yes, at least you now know why they're there. At the lake, my husband feeds the ducks with dog food. Everytime I walk on the duck I'm bombarded with approaching quacks from hundreds of yards away. I'm looking for peace and they're looking for my husband. Glad to have found you, through the magic of Hilarys POTW, for which many congratulations. My hub feeds the birds, but the are all innocous, Sparrows, Turtle Doves and one or two nasty looking Starlings. Makes 'em feel like hunter gatherers I suppose. Love your blog, will be back to read further back. Big flocks of black birds or crows have always creeped me out...might of had something to do with the Hitchcock movie, "The Birds" and some years later Stephen Kings," Crows". Great post...glad I came over from Hilary's...Congrats on POTW mention! I came over from Hilary's POTW. Congrats on your POTW!! Fun read. That was hilarious! So deserving of a Post of the Week mention, Betty. I think we are related through our husbands, by the way. But prepare yourself, I'm about to make you feel so much saner, and far less weird in the eyes of others. Not only were we the neighborhood crow perch, sans cat food or any other understandable crow lure. They'd perch in our maple, and scare the crap out of temporary mail carriers, taking off as one when the mail came. Not only that, but the contractors who built the addition on our old house over-poured the cement for a patio. Leading to them shave off hunks of cement two feet by three feet each, both of them. Which my husband pushed side-by-side underneath the crow infested maple, making it appear that we had people buried in the front yard of our Denver home. We still own that house, but I did manage to convince my husband to move the grave markers for the tenants. At one point I had to talk him out of scrawling names on them, just for fun.